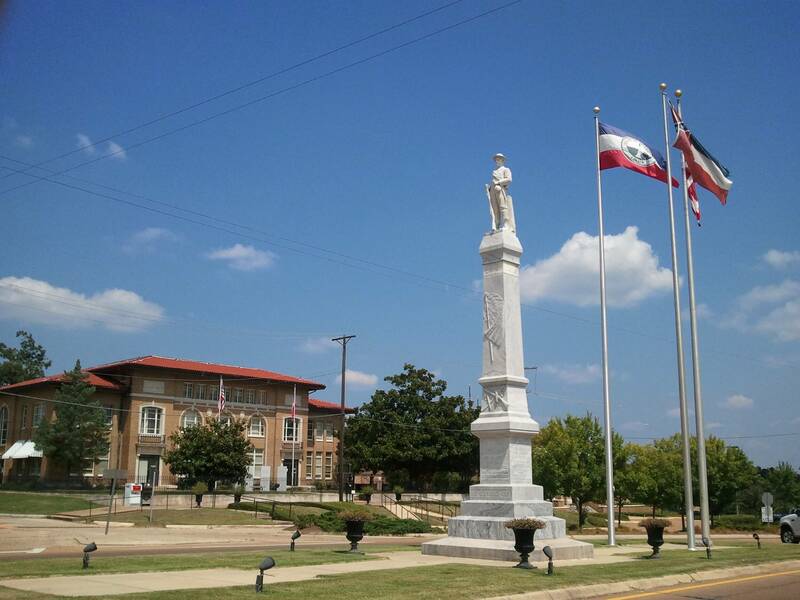 Confederate monument in Rankin County, Mississippi. Photo by Ditch Fisher. This story was orginally published on December 15, 2015. We are reposting to mark the release of Salaam Greene's story, "Standing in the government cheese line with my grandmother as a six-year-old." Rebecca James is an industrious young woman, a single mother supporting her 4- year-old daughter and her 70-year-old grandmother. She worked for close to minimum wage at a local shoe store in Rankin County, Mississippi, and attended a nearby college part-time. Like so many other workers, she also received help from the Supplemental Nutritional Assistance Program–known as “SNAP” or “food stamps”–to pay for food. James worked hard. Through her industry, she was able to get her first, very modest raise, to $8.50 per hour. What James did not understand was that, although her eligibility was never in question, she was obligated to report her job because her earnings dictated the amount of benefits she could receive. Under SNAP, a worker is expected to spend 30 percent of her own wages on food. For every dollar she earns, her benefits drop by 30 cents. A notice came in the mail saying she was to appear in court. And so the SNAP trap shut on James. She was indicted for fraud. She had underreported her income by around $900 per month. As a result, she had erroneously received an average of $270 per month in benefits over a period of 27 months. She hired a lawyer. When he saw that James had not reported her work at the shoe store, the lawyer asked for a plea bargain. The prosecutor said he might let the case go if James could pay the state $7,796.50 in reimbursement and fees on her court date. She couldn’t. James was, after all, still eligible for SNAP, so she couldn’t have had more than about $3,000 in the bank. The amount demanded was the equivalent of almost eight months’ pay for James. She asked for more time to come up with the money, but the judge refused to delay the court date. James was able to come up with about $1,000, and she entered an agreement to pay the rest within two years at $325 per month–about a quarter of her total income. As part of the deal, James pled guilty to a felony. The prosecutor recommended and the judge imposed a three-year suspended sentence, along with five years’ probation and a restriction on her receipt of benefits. A spokesperson for the district attorney did not respond to a request for comment. For $270 in monthly food stamps, James will be a felon for the rest of her life. Unlike similar felonies such as writing bad checks, larceny, and false pretenses, food stamp fraud is not eligible for expungement from an individual’s criminal record– it stays forever. The felony will show up on every pre-employment background check, and few employers take the time to listen to explanations for felony convictions. This can have serious consequences for James’s ability to find work and earn promotions. “I was in school, taking prerequisites for nursing school, and that’s all off now. With that on my record, I don’t know if I could even get into nursing school,” she said. James is not alone; other beneficiaries have been severely penalized because they could not repay some few thousand dollars in overpaid benefits on short notice. Indeed, her case is representative of a public assistance program that gives with one hand and punishes with the other. One of the oversight agencies, the Office of Fraud Investigations, states on its website that its purpose is to identify “SNAP and TANF fraud.” (TANF is Temporary Assistance for Needy Families, a federal public assistance program). OFI says that benefits fraud is “usually the result of a client withholding income or household information”–in other words, cases like James’s. The office’s job is rather easy. A computer program identifies potential mismatches in income between tax and benefits documents, and the office follows up by examining employer pay records. Any verified mismatch could be cause for a referral to the local law enforcement authorities–in this case, the Rankin County District Attorney’s office–for criminal prosecutions. Indictments are brought and, as in James’s case, guilty pleas are like grist for a mill, turning out new convicted felons with stunning efficiency. The state’s other welfare fraud agency, the Office of Special Investigations, covers the exchange of food stamps for money or other non-covered goods like cigarettes. These kinds of investigations are primarily the responsibility of the federal government, which has a series of sophisticated statistical tools (complete with vaguely threatening or nonsensical acronyms like ALERT, STARS, and PARIS) that it uses to identify retailers likely to be exchanging anything other than food for food stamps. The state investigators piggy-back on these federal efforts by referring cases to local criminal prosecutions of both the retailers and the beneficiaries. The SNAP trap isn’t about any particular judge or prosecutor. Rather, the entire machinery is designed to reproduce cases like James’s over and over. But the legal mechanisms that turn under-reported income into a permanent felony record do not target all financial crimes equally. In fact, they are finely targeted on welfare fraud, which American society deems worthy of punishment far exceeding its economic significance. A grocery store in New Orleans. Photo by Karen Apricot. The web of laws governing money flowing in and out of government depends on individuals and corporations honestly self-reporting financial information. If people are not generally honest—honest as a matter of routine, systemically honest– then the fiscal system becomes completely inadministrable. So there is reason for government to be concerned with the misreporting of financial information. However, the greatest threat comes from underreporting income, sales, and employment information on tax forms–not on public assistance forms. While transfer payments under TANF and SNAP represent only about one percent of all government spending, the majority of governmental revenue at all levels depends upon taxes that are calibrated based on self-reported financial information. Given that the state’s finances are far more threatened by lost tax revenue than by erroneous benefits payouts, how does Mississippi treat unpaid taxes in comparison to cases like James’s? According to Kathy Waterbury, as spokesperson for the Mississippi Department of Revenue, if it is determined that tax is due or if a return is not filed, MDOR mails a written assessment, requesting payment. Email notice is also given of this assessment, where possible, and all correspondence with MDOR can be accessed by the taxpayer on the MDOR web portal. Thirty days after the due date stated in this assessment, an additional written notice is mailed and emailed to the taxpayer, providing another 60 days to respond. During that time, the taxpayer may either file and pay the tax, or appeal the assessment. MDOR also makes courtesy phone calls to taxpayers as a reminder to respond to the notice before the end of the 60-day period. Additionally, each month a Statement of Account is mailed to all taxpayers who owe the state. This is like a credit card billing to remind the taxpayers of their balance and provide them payment options. A taxpayer typically receives three monthly statements before the debt becomes a collection case. Even then, MDOR attempts to call and/or visit the taxpayer before taking any enforced collection action or lien. Ten days before a tax lien is enrolled, another letter is mailed to the taxpayer advising that MDOR is about to enroll the lien. This gives the taxpayer another opportunity to rectify the matter before the lien is enrolled. Even after a tax lien is enrolled, it can remain on the books unpaid for quite some time. For example, at the time of this reporting, MDOR’s online tax lien registry shows that R I G Hotel, LLC, d/b/a Econo Lodge Inn & Suites in Rankin County, owes approximately $11,500 in sales taxes. A lien was originally entered in 2010, was re-enrolled in 2015, and has not been paid. In February 2015, a dentist in Rankin County paid approximately $30,000 in various use and withholding taxes that extended back to 2010-2011; the tax lien was entered in 2013 and re-enrolled in 2015, as the state worked five years to recuperate its lost revenue. Sometimes it takes longer. Another Rankin County resident currently owes $11,117 in income tax from the year 2004. A tax lien was entered in 2011. It has not been paid and was re-enrolled in 2015 for $13,890.43. The same individual has also had three other tax liens enrolled against him, none of which have been satisfied. None of these taxpayers responded to Scalawag’s requests for comment. According to MDOR, the agency knows of $190 million in underpaid Mississippi taxes–for 2014 tax year alone. Most of that is owed by businesses in, e.g., sales taxes. But not all tax underpayment is fraud. In MDOR’s view, “most non-reported tax is due to human error or unfamiliarity with the tax laws.” Unlike the automatic criminal prosecution of alleged benefits fraud, Mississippi does not pursue criminal prosecutions for error or ignorance of the law when it comes to taxes. In other words, for MDOR, criminal tax prosecutions are not so simple as finding that requested information was omitted or stated incorrectly. MDOR is prepared to give the benefit of the doubt to taxpayers who merely fail to report something–even something expressly called for on the tax return–absent some further evidence that the omission was knowingly and specifically intended to defraud the government. For a glimpse of what successful tax fraud prosecutions are like, we can look to the case of Steve Page. Page was the owner of the Fannin Mart Restaurant in Rankin County, Mississippi. He repeatedly underreported gross retail taxable sales. According to publicly available documents, the first tax lien placed against him was in August 2012, concerning taxes of more than $1,000 for approximately $10,000 in underreported sales in March 2012. Over the following two years, sales tax liens totaling well over $400,000 were placed against Page, representing millions of dollars of underreported sales. He also had individual income tax liens of over $15,000. This means he mischaracterized his own personal income by almost half a million dollars. Page’s attorney did not respond to requests for comment. After more than two years, the Mississippi Department of Revenue decided that criminal prosecution was justified and referred the case to the Rankin County DA’s office. On Oct. 6, 2014, the DA’s office filed an indictment in Rankin County Circuit Court. The assistant district attorney indicted Page for only a portion of the fraud, limiting it to sixteen counts of sales tax evasion covering an eight-month period in 2012. And yet, even while he was under indictment, additional liens were placed for more than $50,000 in underreported sales in January and February 2015. Notwithstanding this, prosecutors offered Page a plea deal in which he pled guilty to only two of the counts against him. He received a five-year sentence, with two years suspended and the remainder under house arrest–and a requirement to pay back the taxes owed. Steve Page’s tax fraud involved hundreds of thousands of dollars in lost state revenue. Rebecca James’s welfare fraud involved only $7,796.50. But Page’s plea deal was remarkably similar to hers. This similarity can be attributed to a fundamental difference in the way the state, and also the public at large, thinks about tax fraud and benefits fraud. Tax enforcement is not designed to punish. It is built around the goal of revenue collection. The department in charge is named “Revenue”; the crime in question is called “evasion.” The cost of collecting is kept as low as possible in order to ensure the best possible return. Form letters are cheap, even sending two or three collection notices is relatively cheap. Phone calls are almost as cheap. A civil tax lien or garnishment is much less expensive than a criminal conviction, even by plea deal. Meanwhile, any criminal indictment starts a process that can lead to a very time consuming and costly trial, and it may not be feasible for the state to back out half-way through. Although some dozen or so high-profile criminal convictions (like Page’s) may be necessary as a deterrent, for the most part the cost simply isn’t worth it. By contrast, benefits fraud enforcement is designed to be punitive. The department is named “Fraud,” and its focus is on the culpability of the criminal rather than harm to the government. In the retributivist philosophy that guides benefits fraud enforcement, simple repayment of lost revenue is not enough, since it simply brings the offender and the government back to square one. Something more is required in order to punish the offender in the way that they deserve. They must pay, and then, they must pay. In such cases, the department sends a single letter–basically a gesture toward due process–giving ten days for the recipient to file a “response.” There is no benefit of the doubt, no assumption that information was omitted due to oversight or unfamiliarity with the law. Unlike the tax letters, this notice does not say that repayment of the overage will satisfy the debt; this letter already frames the case in the authoritative and adversarial posture of litigation, demanding an explanation. After ten days, if no response is received, MDOR refers the case to the local district attorneys, and their mindset is institutionally prosecutorial. They are prosecutors–their job is to indict and convict criminals. And so that is what they do. Fiscally, it makes no sense to treat benefits fraud more aggressively than tax fraud. Tax fraud prosecutions can be profitable, whereas benefits recipients charged with underreporting income or assets are more likely to lack the funds to repay. They more often end up going to jail, imposing still further burdens on state coffers, rather than replenishing them. The difficulty is starker still when considering the routine criminal prosecution of those who exchange food stamps for money, which is given the grandiose name “trafficking.” Unlike underreporting, this type of fraud costs the government absolutely nothing, because the offenders are receiving, and spending, the right amount of benefits. So-called benefits “trafficking” is the perfect example of a victimless fraud–and every dollar spent investigating and prosecuting it is pure loss. The only possible justification for this prosecution is the moralizing desire to control what poor people choose to buy. And yet, despite the lack of any real reason for concern, welfare fraud provokes indignation and rage in many Americans. This prosecutorial zeal reflects this reaction, but it is not unique to Mississippi, or to state governments. It is present in the United States Congress, too. Even when Congress has expanded transfer programs, it has frequently marked a great deal of funding specifically for investigating and prosecuting benefits fraud. And it has stiffened the penalties. Indeed, there is an atmosphere of political mania around benefits fraud. It is evident in Reagan’s fictional “welfare queen,” a hyperbole intended to represent a whole class of people. It is evident in the Obama USDA’s memo calling for more administrative actions against beneficiaries in trafficking cases. And it is especially evident in the arcane and bizarre battle of Rep. Sam Graves (R-Mo.) to prevent SNAP recipients from committing “fraud” by receiving the rebates that some states provide for returning aluminum cans and glass bottles to a recycling center. In another example of the political mania surrounding benefits fraud, Robert E. MacDonald, the mayor of Lewiston, Maine, recently wrote an angry op-ed in a local newspaper demanding that the names of all welfare recipients be published. He wrote, "Our liberal, progressive legislators and their social-service allies have made [welfare recipients] a victimized, protected class. It's none of your business how much of your money they get and spend. Who are you to question it? Just shut up and pay!" In contrast to such indignation, income tax fraud is viewed almost sympathetically. The IRS auditor and the state revenue agent are popularly reviled as villains out to get everyone, and tax “avoidance” is construed by some as more a duty than a crime. Where does this divergence come from? Why does even harmless benefits fraud invoke a desire to punish at any cost, while costly tax fraud invokes popular sympathy and sane efforts at collection? According to a certain middle class perspective, welfare recipients should be grateful that society has decided to support them in spite of their failure. The perception of “ingratitude” is a powerful emotional driver in the popular indignation at petty welfare fraud. Because fraud appears to signal bold thanklessness, welfare recipients easily become villains for selling their benefits or concealing even a very small income. The effect is heightened among those who already resent the enforced charity of government (even though welfare costs only one cent on their tax dollar). Resentment at the welfare system in general, and the apparent ingratitude of recipients in particular, can become a sense of righteous grievance at any irregularity. On some level, the indignation is a feeling we can all appreciate. Consider, for example, the TARP bailouts of 2008, or the “structured” bankruptcy of the United States auto industry in 2009. These were industries in need, and the need was largely of their own creation: They had failed. There was public outrage, and their receipt of benefits was connected with invasive hearings, and various (mostly petty) bureaucratic strings were attached to the receipt of the benefits. Any whiff of celebratory atmosphere on Wall Street during the early days of the recovery, any bonus given to an executive, was the subject of further outrage. The Occupy Movement was largely a manifestation of this indignation. And yet, it isn’t nearly the same. If you consider the trillions involved in the bailouts, particularly when compared to the relatively insignificant amount allotted for SNAP benefits, the outrage over food stamps seems hyperbolic. This emotional disproportionality is even more evident in the lack of response to the countless “little” acts of daily government largess–like billion-dollar stadiums given to sports franchises, or the millions in direct payments to big commodity firms under the Farm Bill, and so on. These handouts get at most a momentary outcry, but no lasting sense of indignation. Certainly we do not rage about Rankin County’s cotton farmers, like King Farms, Larry Cross, or J & J Farms. The three of them have accepted well over $2 million in benefits, mostly in direct cash payments, under the Farm Bill, according to the Environmental Working Group’s farm subsidy database. But the simple acts of applying for and receiving these benefits do not trigger national ire. This despite the fact that, here too, the system operates on the assumption of honest self-reporting, and the programs are ripe for fraud. SNAP benefits and farm subsides are more connected than one might expect. In fact, they are generally secured through the same USDA legislation. But in battles to pass that legislation, Congress has again and again obsessed over SNAP fraud while ignoring cases like that of Jimmy Thomas Sasser in North Carolina, who committed Farm Bill fraud worth tens of millions of dollars and was sentenced to four years. Like SNAP benefits, farm benefits are supposedly designed to help in times of economic trouble. But even “welfare fraud” isn’t all that objectionable if the recipient is a business owner. The special indignation directed at SNAP benefits must be coming from elsewhere. It’s not about perceived ingratitude or the potential for fraud; it’s about something else. “Independence” is perhaps the most fundamentally American concept. Our national holiday is Independence Day, and “freedom” and “liberty” are largely rhetorical stand-ins for personal independence. What we think of as the American Dream is often times really an aspiration to individual independence from our communities. But this myth elides the ways that our society and lifestyles are built on a tight and complex web of interdependence, much of it public. All those cars have to drive on something, and we cannot each build our own roads. The problem with SNAP benefits—perhaps more than any other kind of benefit—is that the program punctures our cherished myths of individual self-sufficiency. Food stamp assistance represents a failure of independence. The beneficiary is essentially admitting that she cannot provide food for herself–either through her own efforts, or indirectly through the marketplace. She is (she must be) at fault in some way. The only alternative–that her poverty might be part of a collective, social failure—becomes unthinkable given our widespread ideological commitment to independence. In other words, the shame of welfare is in the fact of needing it—the more you need it, the more shameful it is. The more shamed it is. Daily, all of us–billionaire magnates, middle-class homeowners, and the working poor–accept government assistance in one form or another. But what provokes shame and indignation is the appearance of needing it. To take assistance and not need it–or at least to appear, to ourselves and others, as merely ‘milking the system’ or ‘catching a break’ or ‘receiving what we’re due’–is one thing. But to accept assistance and need it, to appear as needy, is another thing altogether. It gives the lie to the mythical country of independence. Especially with food assistance, the supposed failure of independence is absolute, because it means being dependent on the government, not for corporate tax breaks or first-time homebuyer loans or student debt relief or even farm subsidies, but for the necessities of life. It makes matters worse that the shame and indignation of dependence are racialized in the American imagination. In Mississippi, 21 percent of the state is on food stamps, and the positive impact of the SNAP program spans all races. In fact, nationally, Black households make up only 25 percent of SNAP beneficiaries; Whites are by far the majority. And yet, the myth of middle-class deservingness, poor shaming, and racialized assumptions about America’s class structure intersect in ways that make it easier for the White middle class to believe, despite all the facts to the contrary, that poverty could never happen to hard-working people “like them.” It’s easier to heap shame and indignation on people that you erroneously imagine to be fundamentally different from yourself. Consider what it means for our public policy when the shame of welfare becomes structurally embedded. The more the help is needed, personally and socially, the more grudgingly it is given, and the more strictly the beneficiaries will be judged for any apparent deviation from what is expected of them. On the other hand, the less the help is needed, the more open the hand of government will be to give it, and the less seriously any irregularity will be pursued as crime. “And they know about this food stamp thing, too, so I don’t have to worry about that anymore,” she said. The food-stamps ban placed on her has now expired, and she is eligible to apply for benefits again because her income still qualifies. Would she apply? Her face creased with worry. In 2015,The New York Times ranked Roanoke as one of the hardest city's to get out of poverty. How is the Virginian city drawing on its long civil rights legacy to image a more prosperous future for all its citizens?